Put eggs and milk into a bowl and mix well. Add ingredients in the order of: Morinaga pancake mix, vegetable oil, and salt. Mix well each time after adding new ingredients. Put the batter into refrigerator and let it rest for 30 mins. Cook all the batter in same way and pile them up. Heat up a frying pan to about ~140°C. Pour one tablespoon of batter onto the pan and spread it to form a round shape. Make 3-5 pieces each time. 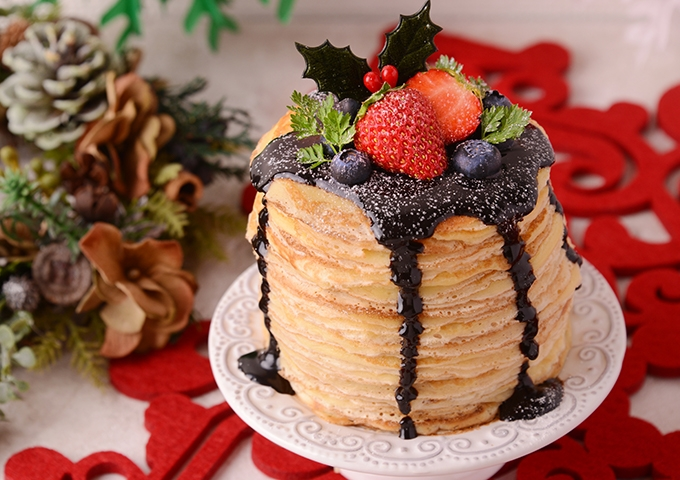 Cool down the pancakes and top them with Morinaga Chocolate sauce. Use strawberries, blueberries and French parsley to garnish. At last, sprinkle a thin layer of powerder sugar to finish up.